Oxford Instruments says its new, faster handheld XRF analyser for high performance measurement – the X‑MET7000 eXpress – “delivers the high performance that is needed when measuring trace elements without compromising on time. [It] delivers accurate analysis, lower limits of detection, improved precision (repeatability) and faster analysis time. With one pull of the trigger, the X-MET7000 eXpress analyses, verifies and screens materials up to four times faster than the X-MET7000 QuickSort. This can be critical when dealing with large volumes of samples to analyse in limited time. It includes Oxford Instruments’ 40 kV X-ray tube and high resolution, high count rate Silicon-drift detector (SDD). The X-MET7000 Series comes with the largest alloy grades library available on the handheld XRF markets, the company claims, providing more than 1,600 grades to ensure accurate identification of metals. As part of the X-MET7000 Series, the X-MET7000 eXpress offers the largest touch screen available on the market with its intuitive and easy-to-read graphical user interface. Large functional icons make learning how to use the instrument simple and quick. The bright and high contrast 4.3” Blanview® transmissive LCD touch screen ensures optimal outdoor viewing, even in direct sunlight. Its ease of use guarantees maximum productivity. Up to 10-12 hours battery life enables operation for a full working day on a single battery charge. 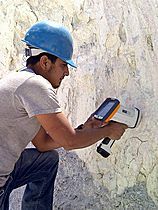 These handheld X-ray Fluorescence (XRF) analysers offer reporting flexibility; reports can be downloaded on a USB memory stick, or to a laptop using a USB connection or WiFi. The results screen and reports can be easily customised, e.g. to show pass/fail messages. The rugged, yet light and compact design of the X-MET7000 Series withstands harsh environments and weather conditions.